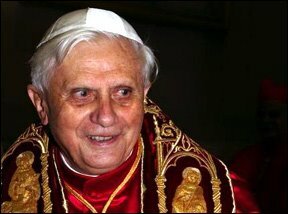 Pope Benedict XVI recently gave a speech in Germany in which the most notorious part is his criticism of the violent methods of jihad. This will probably generate a lot of attention from outspoken Muslims, educated or not. It might inflame anti-Christian sentiment among the followers of Mohammed. However, if you read the whole speech, he dedicates most of his intellectual effort towards questioning the secular world and its use of reason. He criticised the West for rejecting god and faith and blames it for not understanding the way religious people think. He went ahead and said that the root of atheism is "being afraid of god"
First, I believe that one of the consequences of the Enlightenment is the opening of the mind of the common man, not only the ones of naturally illuminated scientists. It made possible the transition from societies that believed in supernatural beings and that were tied to superstitious ideas to societies which, by majority, reject gods and that at the same time enjoy the highest levels of human development like the Scandinavian countries. It made possible the advance of technology, the Industrial Revolution and the wonders for space flight and modern medicine. The Enlightenment allowed the Western world to finally surpass the once insurmountable achievements of the Classical Era. It is true that those same advances have placed us several times in the verge of a nuclear winter and that we have not yet solved the issues of fossil fuel scarcity and major climatic change, but it is only through the scientific method that we will be able to solve those problems, with more or less pain. The use of reason, using logic as a tool and knowledge as building blocks, has constructed the hope of a world that could finally live in harmony, freed from superstition, in equilibrium with nature and emotions, id est, the dream of Epicurus. Second, I do not understand atheism as being originated in the fear of deities. I can only speak for myself in this area, however, I am sure that many atheists share a similar view. Atheism, according to me, is a misnomer. If we follow the Greek roots we conclude that it is the negation of god. However, the process of thought that leads to atheism in many people is not a rejection of a concept, but the construction of a whole intellectual framework that does not include the supernatural. The lack of need of superstition becomes a by-product of that framework, not the core of the atheist thought. The idea of seen a person praying or reading the horoscopes evokes amazement and not disgust. Third, I do not understand what the pope means by saying "the West". Is the US the West according to his definition? Are only the East and the West Coasts of the US part of the West? What about Eastern Europe? Where does Latin America fit? If West means secular, we would have to divide countries according to unspecified parameters in order to determine which segment of the population belongs to the West and which does not. Suddenly, to be a Westerner would become a stigma, just as what happened with the word "liberal"
To conclude my response, I will repeat what I have said several times thoroughout this blog. The appearence of sets of beliefs that consider themselves unique, the only truth, the only bearers of the real message from the divinity has caused too much loss of life, too much misery and destruction, too much loss of knowledge that will never come back. The destruction of the Hellenistic culture and its replacement by a fundamentalist philosophy represents, the way I see it, the worst sociological and political disasters of known history.